The tendency to focus on information or examples that reinforce preexisting beliefs while ignoring things that contradict those beliefs. Past negative experiences will affect a person’s perception of future sales people. Any mistakes or misspoken comments may be construed as intentional and collapse any initial good will. Confirmation bias itself is the barrier to winning the attention of a prospect. Confirmation bias supports the “Hindsight bias” as a means to selectively accept facts that further a person’s initial beliefs. 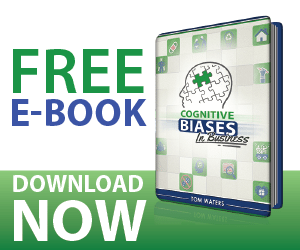 You can potentially overcome confirmation bias by attributing personal features, style, and talking points to your sales presentation that is distinct from the traditional market. Break from the mold! “Different is better than better.” is an excellent ideal to remember when positioning your company and your value proposition. Experiment with techniques that separate you from your competition to break the confirmation bias.